Arctic's Temperature Continues To Run Hot, Latest 'Report Card' Shows : The Two-Way The extreme warming trend continues, and scientists fear that floating sea ice will be gone by midcentury. That will have extraordinary effects closer to home. Melt ponds dot a stretch of sea ice in the Arctic Ocean, north of Greenland. This year was the Arctic's second-warmest in at least 1,500 years, after 2016. Researchers say there was less winter ice in the Arctic Ocean than ever observed. And ocean water in parts of the polar Barents and Chukchi seas was a whopping 7 degrees Fahrenheit higher than just a few decades ago. It's a trend that has some calling the state of the Arctic a "new normal." But Arctic scientist Jeremy Mathis says that term doesn't work for him. "There is no normal," he says. "That's what so strange about what's happening in the Arctic. ... The environment is changing so quickly in such a short amount of time that we can't quite get a handle on what this new state is going to look like." Mathis runs the Arctic program at the National Oceanic and Atmospheric Administration. He says changes in the Arctic are going to affect everybody in the Northern Hemisphere. That is because masses of air and ocean currents circulate between a cold Arctic and the warmer parts of the Northern Hemisphere. It's sort of like a conveyor belt that is driven largely by the temperature difference, or gradient, between the two regions. 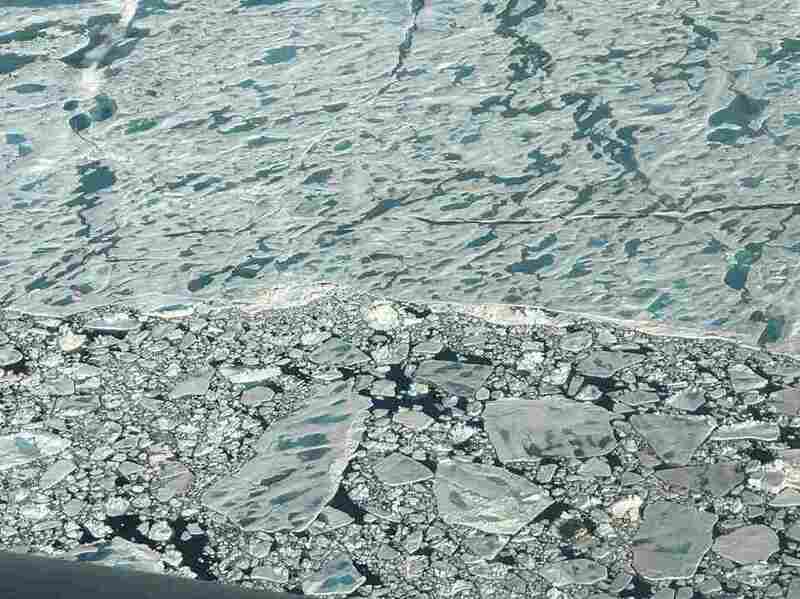 With less snow and ice to reflect the sun's rays, the Arctic isn't so cool anymore. "The heat is not being reflected back into space," Mathis says. "The heat is now being absorbed into the land and into the [polar] ocean." And he says that is going to alter the weather — things like the jet stream and rainstorms and hurricanes. "Whether they be wildfires out in California or hurricanes down in the Gulf," Mathis says, "we have to think about the impacts that changes in the Arctic are having on those disruptive climate events." Scientists say they can't attribute any particular drought or hurricane to changes in the Arctic. But computer simulations show changes. For example: wind. "We're talking about a reduction of wind power all the way across the Northern Hemisphere, midlatitude," says Kristopher Karnauskas, an atmospheric scientist at the University of Colorado, Boulder. Writing in the journal Nature Geoscience, he says average wind speed could drop significantly over the next 80 years. That could put a damper on wind energy. "For example," he says, "in the central United States, the models are predicting somewhere between 10 and 40 percent reduction compared to present-day amount of wind power." A day that is on the low end of windy would, on average, become the norm. Karnauskas notes that lots of other weather phenomena affect wind besides what happens at the North Pole, so those impacts could be blunted. But his models show that the Arctic is a big player. "We live in between the Arctic and the equator," he says, "and those are like the two ends of the global energy machine, the weather machine." And there's more. A warmer Arctic could cause more drought in California. Atmospheric researcher Ivana Cvijanovic also ran computer simulations of a warmer Arctic, at the Lawrence Livermore National Laboratory in California where she works. She found that air circulation over the eastern Pacific could change in a two-step process that ends up steering rain from the Pacific away from California by the end of the century, or even before. "So on average, it will be 10 to 15 percent drier," she says. Cvijanovic notes that some years would still be wet and that other weather patterns outside the Arctic, things such as the El Nino weather cycle in the Pacific, could counteract that drying effect. But again, the Arctic effect is powerful. "It's not just a problem for polar bears," she points out. "It's not just an isolated problem. It can come back to haunt everyone." Writing in the journal Nature Communications, Cvijanovic says it's too early to blame the Arctic for California's recent drought. But she says that drought is a good illustration of what the future could bring.